How can we miss a memory we’ve never had? A sound or touch never experienced? Might we miss a vision never once reflected in our eyes? Though no living being remembers, the passenger pigeon will not fade from memory to myth as we have the writings of early explorers and the first naturalists, as well as drawings, artwork, and some few photographs of the passenger pigeon. These are artfully assembled and narrated by Errol Fuller in his new book, and they bring the passenger pigeon back from memory to life. I teach conservation biology, or what I sometimes call “Extinction Biology” at Washington State University and recently read “The Passenger Pigeon” by Errol Fuller. I was momentarily disappointed when it arrived in the mail as it superficially resembled a “coffee table” book, richly illustrated, but with limited text and information. I couldn’t have been more wrong and certainly shouldn’t have judged this book by its beautiful cover. As a conservation biologist and wildlife ecologist studying threatened and endangered species, I’ve been on a quest, both personal and professional, to better understand how Americans could have caused the rapid extinction of what might have been the most abundant bird in the world. How could we go from perhaps billions of birds to zero in less than 100 years? My interest in the passenger pigeon (Ectopistes migratorius) was prompted by the centennial of the death of Martha, the last known passenger pigeon that died in captivity 100 years ago on September 1, 1914, at the Cincinnati Zoo. This historic tragedy is being used by many conservation groups across the country participating in centennial remembrance events, including those of Project Passenger Pigeon. “The Passenger Pigeon” by Errol Fuller is one of several new books to be published about the extinction of the passenger pigeon. Fuller is an artist and writer who has produced a number of books on extinction and detailed accounts and depictions of extinct animals, including one on the Great Auk (Pinguinus impennis). And so you see, in my haste to judge, I originally missed the whole point of Fuller’s book. It is intended to be a visually rich, artistic expression about the extinct passenger pigeon, and it is. A major feature of Fuller’s book is the beautiful artwork, photos, and graphic illustrations that are used to bring the passenger pigeon to life for the reader. In addition to some of the images from early artists that are in the public domain (see top photo), the book contains many photographs of passenger pigeons that come from collections and sources not readily available to the public. The photos are in some way haunting. For you can see some of the last few passenger pigeons held in captivity in the aviaries of Charles Otis Whitman and elsewhere and cringe, realizing that we did not know enough at the time to quickly establish a specialized captive breeding program of the kind now used in modern, last-ditch efforts to save endangered species. The photos are haunting because you see passenger pigeons sitting on wooden roosting poles and can easily imagine the bobbing movement of their heads as they look at you, but there are no videos or motion. They are frozen in time. There are no sounds of their cooing or calls, only a series of musical notes written on a sheet by an observer, and simple words from historical quotes used to describe their vocalizations. And yet, even without movement and sound, the book brings the passenger pigeon to life for anyone who has paid even scant attention to birds. However, while the book is beautifully and richly illustrated, the writing should not be discounted as it is detailed, accurate, and up to date. Not only is the story of the passenger pigeon told succinctly and well, but there is little doubt the writing and analyses come from someone dedicated to conveying accurate information. In short, my initial momentary skepticism about the value of this beautiful book has been replaced by complete enthusiasm. It is not a book I will read once and then put away on a dusty library shelf. I will return to it again and again as I seek to remind myself of key facts and sources of information, and to thumb through the beautiful and haunting images of passenger pigeons while I contemplate whether we have learned the necessary lessons from their extinction. Unfortunately, as an ecologist, I’m firmly convinced, and worried, that we’ve yet to learn our last lessons from Martha. When people look at a large expanse of mature trees, they call it a forest. But it’s not really. Not without the plant and animal life that makes up a whole forest community and the different forested ecosystems that vary in composition and abundance of interacting species. Why would we think that trees alone make a forest? The world of beautiful art surely would not be complete with a single painting. Who would expect a single actor to represent the comedy, the drama of all humanity? Is one poem the best of all and the only needed? Can a single song capture the human heart, the human spirit? And so too, should we expect a forest to be complete, to be rich and fully beautiful with only trees? The once vast hardwood forests of central and eastern North America are now empty. They may look like a complete forest, but they are not. No longer is there the startling, heart-throbbing, thunderous rush of tens of thousands, millions of wings of passenger pigeons descending in clouds from from the skies, fluttering down through the trees enmass to forage on acorns, chestnuts, and beechnuts on the forest floor. Instead we have silence. Listen carefully. Quietly. The sound of extinction is silence in the forest. 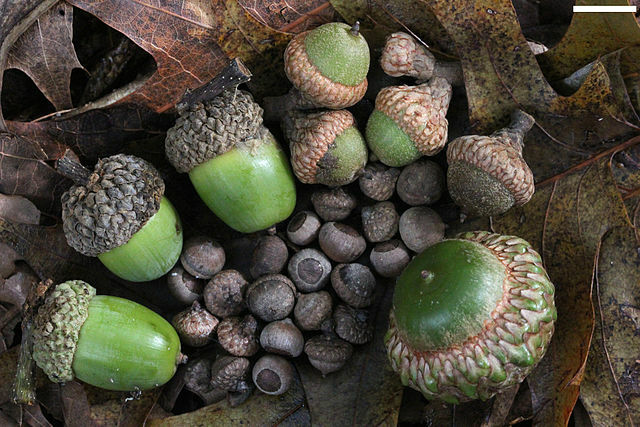 Our hardwood forests of red oaks, white oaks, beech trees, chestnuts, maples, and other trees and shrubs that produced acorns, nuts, and fruits are now devoid of what was the most abundant bird in North America. In settling the U.S., as we spread across the landscape from east to west, we cleared vast swathes of hardwood forests because the timber seemed inexhaustible. The sounds of axes and saws rang a death bell for the billions of passenger pigeons, for their former numbers surely could not have been maintained under such extensive loss of habitat. But as an avian ecologist, I suspect that if we had only stopped with clearing hardwood forests, we might still have the passenger pigeon with us. Possibly they would be in flocks of tens or hundreds of thousands instead of billions, but they might still shock our forests with their frenzied communal nesting as they laid a single egg, fed crop milk to a single squab, and then abandoned their still unfledged young to move on to other forests with new resources. By necessity, the story of the passenger pigeon is one of killing and death. For that is what we did to them. We killed them, literally, by the millions upon millions. We pursued them relentlessly in their communal nesting sites that covered hundreds of square kilometers. We pursued them during their flights that darkened the sky for hours, even days on end as they migrated by the millions and billions from one forest region to another. We ambushed them at dusk when they returned to favored roosting sites. Killing passenger pigeons, as many as possible, by any means possible, became the norm. Their mass arrival in a region ignited a kind of community hysteria, a circus of killing by club, gun, baiting, poisoning, netting, and burning and cutting of nest-filled trees, that knew no limits. That is, until they suddenly and completely disappeared. As an avian ecologist, I’m both fascinated and horrified by the extinction of the passenger pigeon. I’m horrified by the brutality of the mass killings and wanton waste, even if ostensibly for food. As a scientist, I’m fascinated, as many will be, by their sudden disappearance. One moment they’re here in unfathomable abundance. Then, like flipping a switch, they’re gone. Completely. How can we miss a memory we’ve never had? To study and understand an animal well, you need to observe it closely until you sense what makes it tick, what makes it unique, how its world differs from ours. Works like “The Passenger Pigeon” by Errol Fuller help bring extinct species back to life by immersing us not just in the factual knowledge and details of their behavior and existence, but also by showing us through stories, artwork, and photos what they were like. One hundred years means relatively little to the history of the Earth and the natural world – unless humans are involved. In only a few hundred years of industrial civilization, we are well along in decimating the beauty and diversity of the natural world. Our forests and grasslands and skies grow increasingly silent and empty. The vast almost unimaginable numbers and migrations of some species are coming to an end. More species than the faint-hearted can bear to witness are entering the declining, tenuous phase of their existence. We would do well to remember and cherish what we have now, as only memories are what we too may pass on to the future world, as we now remember the passenger pigeon. For more information on The Passenger Pigeon, see Princeton University Press. For more information on the author of The Passenger Pigeon, see Errol Fuller. [Top Photo (pair of billing passenger pigeons): Reproduction from John J. Audubon plate. Source: Wikipedia. Image in public domain. Second Photo (pigeons in aviary): Passenger pigeon (center) along with other pigeons in the aviary of Professor C.O. Whitman, University of Chicago. Source: Wikipedia. Image in public domain. Third Photo (acorns): Acorns large to small. Source: Wikipedia. Author: David Hill. CC-BY-2.0 License. Conservation Biology (Natrs 450 / 550) 3 cr. The science of conserving life on Earth. Dynamics of conserving biological diversity and threatened and endangered species. Junior-senior-graduate standing, next offering Spring Semester, 2017. Instructor: R. Sayler.